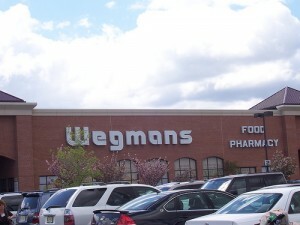 Wegmans may finally be coming to D.C. according to the Examiner. The family-owned mid-Atlantic chain was named the best grocery store in the nation for “overall satisfaction” according to the most recent rankings by Consumer Reports in 2009. D.C. officials are hoping that the massive Walter Reed Army Medical Center’s planned redevelopment in Northwest will finally give them the bait they need to lure the District’s first Wegmans grocery store. The highly sought-after grocer has two scheduled meetings this week with Mayor Vincent Gray and council members at a retail development conference in Las Vegas that historically has been the breeding ground for major real estate deals in the District. That conference, the International Council of Shopping Centers (ICSC), is where almost half of all retail leases are signed every year. As for Walmart, the other chain with its eye on D.C.– Consumer Reports placed it near the bottom of those 2009 rankings. Charles Fields, a spokesperson for Consumer Reports said that while Walmart is a price leader, it earns low scores on service, the quality of its meat and vegetables and store cleanliness. "It's not like only black neighborhoods get gentrified"